The recent house price rally was financed with stable, fixed-rate mortgages. Stable mortgages make for a stable housing market. The pundit sounding the alarm today is Charles Hugh Smith. I like his writing, and he generally displays a great understanding of financial history and the workings of housing markets; however, this time I think he is wrong. Is Coastal California housing at the peak of another bubble? My data and analysis says no. Expensive? Yes. Bubble? No. 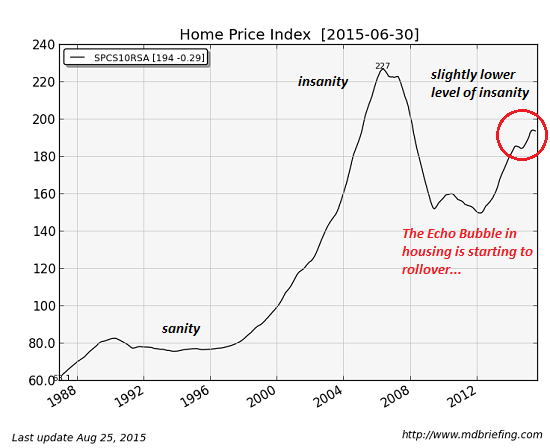 If inflated house prices don’t fall, is it still a bubble? How far must prices decline before it’s considered a bubble? It probably doesn’t matter much to the underwater borrowers who must wallow in financial pain. Whether or not it’s considered a bubble, if market pricing fails to find support, I don’t believe prices will fall much. If an economic upheaval causes large numbers of mortgage defaults, lenders will use their “new and improved” loss mitigation procedures, can-kick the loans, and wait out the economic storm. Rather than signal an upcoming decline in prices, mortgage defaults will signal further declines in sales volumes. In fact, if we do see another housing bust, I predict we will see sales volumes fall to lows never before measured, even lower than the worst sales years of the most recent housing bust. Why will sales volumes fall so low? If sellers are trapped in cloud inventory, unwilling and unable to lower price, and if buyers are abruptly limited by lower borrowing power, financed buyers simply won’t be able to transact, no matter how much they substitute down in quality. If financed buyers can’t buy, sales volumes will crater — prices won’t go down much, which is what lenders are after — but sales volumes will necessarily suffer. That’s how I believe the next housing bust will turn out. 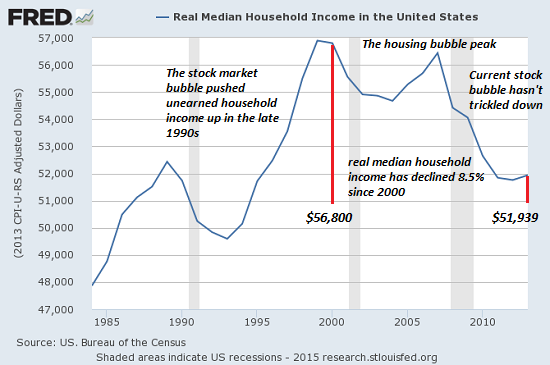 And here’s the knife in the heart of the Echo Housing bubble: declining household income. 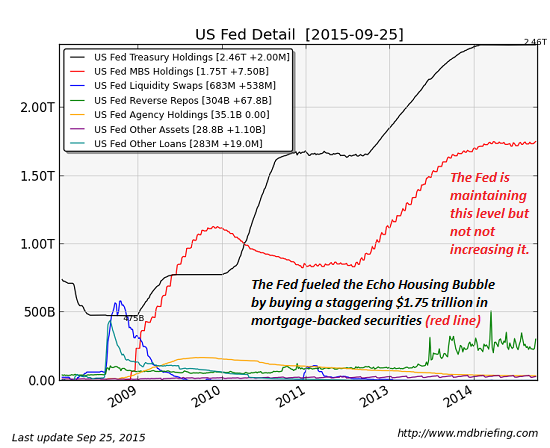 The Federal Reserve-induced Echo Housing Bubble is finally starting to roll over, and the bubble’s pop won’t be pretty. Why is the bubble finally popping now? His description of the market performance as an “Echo Bubble” has merit, but I’ve characterized it as the reflation of the old bubble because the primary reason the market has been so heavily manipulated to drive prices higher is to restore collateral value to the bad loans underwritten during the previous bubble. Many prospective buyers are unconcerned about the prospect of higher mortgage rates (See: Rising mortgage rates don’t care about homebuyers’ attitudes). Perhaps this is a good sign that buyers aren’t as easily manipulated by realtor fear mongering to create urgency. — lemming-like buying of housing for rentals by everyone from Mom and Pop to huge hedge funds. The well’s gone dry, folks. There isn’t going to be another push higher or a third housing bubble after this one pops. Really? This is where he jumps the shark. Though it’s been slow in coming, the economy is improving, people are getting jobs and forming new households, and wages will start rising more briskly soon. In other words, the fundamentals are finally getting better, and this will spur buying demand as the props from the reflation rally wear off. Let’s start with the basics: demographic demand for housing and the price of housing. There are plenty of young people who’d like to buy a house and start a family (a.k.a. new household formation), but few have the job or income to buy a house at today’s nosebleed level–a level just slightly less insane than the prices at the top of Bubble #1. Posting a chart does not make his point. Job creation, household formation, and wage growth point to increasing demand, irrespective of the price levels. As prices get push to the limit of affordability, appreciation slows dramatically, but it doesn’t signify a bubble waiting to pop. The petering out of a reflation rally is not without precedent. In Great Britain, they inflated a massive housing bubble in the 1970s, then they stimulated a reflation rally, probably to bail out their banking system like we did. That rally failed to reach the previous peak, and prices drifted back down to fundamental values. It took 15 years to get back to peak pricing (See chart below). Of special interest is the period from 1980 to 1982 when house prices drifted lower when their reflation rally fizzled. As you may recall, the early 1980s were a period of high and rising interest rates, not just in the US but in Great Britain as well. Their reflation rally died because higher mortgage rates reduced borrowing power, the same effect predicted here in the US. It’s considered bad form to describe today’s prices as insane. It tends to hurt the feelings of everyone who’s counting on the Echo Bubble to 1) make them even richer or 2) bail them out of the hole they fell into after Housing Bubble #1 popped. That is an uncomfortable truth. Exhibit B is the insanely low mortgage rate, which has finally reversed course and is notching higher after 30 years of going lower. Why are today’s rates insane? Risk. Mortgages are intrinsically risky. People with high credit scores lose their jobs, experience horrendous medical crises, get divorced, etc., and the net result is a default that is unexpected. Then there’s all the credit-rating-of-501 crowd that was always one missed paycheck away from defaulting on their FHA/VA mortgage. Once the layoffs begin scything through Corporate America and struggling small businesses, those living paycheck to paycheck buyers of Echo Bubble housing will have no choice but to jingle mail the keys to the bank. While it’s true that the FHA underwrites loans to unqualified borrowers, they will have plenty of choices other than jingle mail (strategic default). Bankers learned from the housing bust that modifying loans to prevent foreclosures and keep REO off the market is essential to maintain pricing. Bankers allowed many delinquent borrowers to squat, some for eight to ten years now, rather than foreclose and endure the consequences. I really have no idea what he’s talking about. While the opportunity to buy good cashflow properties is certainly diminished, the likelihood of plummeting rents is near zero. Rents stabilized in 2009 even in the weakest markets in the US after the worst recession of the last 80 years. If rents didn’t plummet under those circumstances, it’s unlikely rents would plummet under whatever doomsday scenario he believes is on its way. 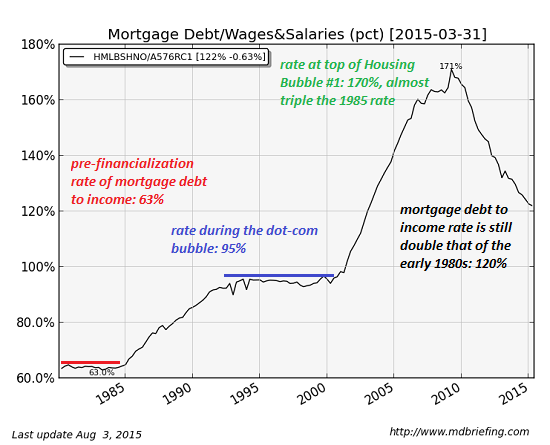 The mortgage debt to household income percentage was bound to increase when mortgage rates went from 18% to 3.5%. 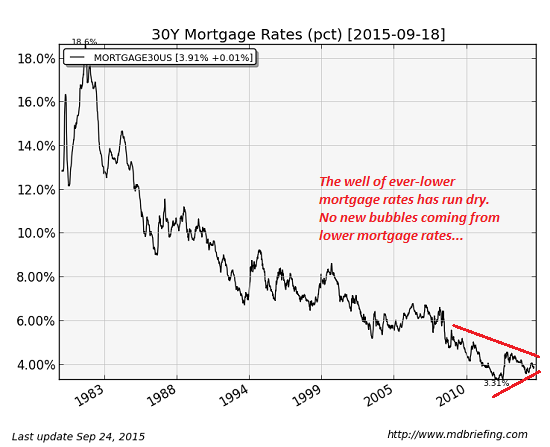 The whole point of lowering mortgage rates was to increase this ratio to bail out the bad loans from the bubble. Might this revert to the mean? Over time, yes, but it may take a very long time. Unless or until the federal reserve starts selling those mortgages, the impact is zero. Further, it’s very unlikely the federal reserve would sell these mortgages if the result was higher mortgage rates and more problems for the banks. And here’s the knife in the heart of the Echo Housing bubble: household income– stagnating for decades for 90% of households–has declined since the Bubble Top when adjusted for inflation. Please explain how declining real income can support nosebleed home prices now that mortgage rates have bottomed and started their inevitable rise from absurdly low levels. Now he is conflating real wages with nominal wages. People borrow money and repay debt with nominal wages, and nominal wages have gone up. In fact, the whole point of generating inflation is to raise nominal wages to make the excessive debts affordable. If this doesn’t translate to a real gain, that isn’t the federal reserve’s problem. If you want to believe the Echo Bubble can continue inflating, by all means take another hit of happy-housing-talk smack. But let me warn you–the high wears off. Now that house prices rest at the equilibrium of current wage affordability, future appreciation will be limited by wage growth (and rising mortgage rates). Future slow wage growth will limit home price appreciation, and it’s one of the reasons I believe the federal reserve will keep the pedal to the metal and not raise interest rates in 2015. Should prospective buyers fear a bubble? When the federal reserve lowered interest rates from the bubble-era 6.5% to the current 3.6%, they imbued the market with tremendous affordability. This lowered the cost of ownership well below the historic relative valuation with rents. This provided buyers with the ability and the incentive to bid up prices and buy homes with stable loan products. While there is no question we are reflating the old bubble, we are doing so with affordable payments and stable loan products; it’s a difference that makes all the difference. The only thing I’m sure of is that rates will be kept negative in real terms for a decade or more. Global commodities (petrol, low cost food commodities, etc) may see continued deflation further accelerating the inflation on domestic necessities. I agree, the commodities rout is shocking the global markets and has meaning behind it. The premise of this blog post is that the US economy is growing so housing is not in a bubble and will not pop. Well… the economy has been slowing so economic indicators will are shifting in the wrong direction. China has begun arresting individuals for exporting large amounts of cash from China so the those looking to get money out quickly may be scared into parking it. The game is quickly changing so we’re not sure the banks will be able to handle what’s around the corner. Maybe they will… maybe they won’t. I agree that home sales will reach recorded lows but ask yourself “What happens to most inflated assets with historic low sales volume?”. Those desperate and can sell will move the price substantially lower. This is naturally occurring in assets with low sales volume. Keeping the volume too low can actually have similar effects as too much sell volume. There must be a balance to keep prices stable. Prices may be justified by today’s indicators but those indicators may change so quickly that housing prices are suddenly at bubble levels with no support. China has begun arresting individuals for exporting large amounts of cash from China so the those looking to get money out quickly may be scared into parking it. This is by far the most concerning issue for California real estate. If this flow of money stops or reverses, it would be a big deal because these are generally discretionary sellers who aren’t impacted by lender policies. If we see a dramatic crash, it would be caused by the flow of Chinese money out of California. Those desperate and can sell will move the price substantially lower. Desperate discretionary sellers may move prices lower, but unless there are huge numbers of these sales, it won’t push prices substantially lower. I think a slow grinding decline is very possible, and it would be fueled by discretionary sellers who want to get out. However, prices are typically “sticky” during a decline because discretionary sellers really don’t want to sell for anything less than the peak value they’re attached to. This is why real estate declines tend to be a slow grind unless large numbers of must-sell inventory hits the market — and the only real source of must-sell inventory now would be Chinese investors responding to changing policies. Yes, times are uncertain. Yet this changes little with how you should live your life. Would you postpone purchasing a house today if you were financially prepared and it fit your family/timing? It depends. Some areas can still be purchased at rental parity after tax deductions are included. Other areas like Irvine I would probably avoid. Avoid until when? How long are you willing to wait, and bet, that Irvine prices will decline? You might want to check your stats. Irvine is already in decline. We are in transition from sellers’ to buyers’ market. All it takes is a few negative articles to shift sentiment at this point. Base pricing in our development is up nearly 10% since we signed our purchase agreement in May. This means little, other than providing some comfort; just as the reverse would mean little, other than providing some discomfort. Even after this recent decline, Zillow is reporting current Irvine home prices as 93% percent of peak prices, which is more than can be said for most of the neighboring cities. It appears prices in Irvine overshot in this “recovery”. “Irvine is already in decline. Not so. Median sales and median list prices are just slightly below all time highs within the last few months. Seasonally adjusted, it would be new highs. The Zillow Home Value Index is a mess and should never be relied on or quoted. Careful that you don’t ignore data just because it fails to tell you what you want to believe. What IR didn’t show rental parity in Irvine with today’s post?? Rental parity is a flawed metric. Very flawed. Rents are increasing very rapidly. Anyone who used rental parity over the last few years would have missed on a great investment since rental parity ignores rental and home value inflation. Ignore rental parity. Many buyers ignored rental parity in 2005 and 2006, and it didn’t work out very well for them. Today’s featured property is listed for a price below rental parity. The calculations are below the photos. The plateau theory doesn’t work for this reason: Prices are supported by moving up. I’m reminded of a paradigm at my own workplace: Those directors and managers who weren’t promoted and were happy with where they were, were viewed with suspicion by upper management and laid off. If you’re not moving up, you’re moving out. High prices are supported by the fear/greed factor: Buy so you can make money and don’t get priced out. If prices start to fall, even by a few points, with some momentum for a year or so, then fear/greed buying dries up instantly and reverses: Why rush to buy when waiting can save/make money? “shadow inventory” can and will sell and continue to push prices down. Someone dies and the home is put up for sale and the buyer drops it a few points. Even if banks kick the cans with remaining shadow inventory and owners who stay put, the Walking Dead’s small transactions can move prices downward quickly. Even if sales volumes can be counted on the fingers of one hand per month, paper values of the remaining massive inventory collapse. Then there’s smart sellers of course. Oligarchs and insiders in the know who see a collapse imminent will dump and take a 10% hit but at least they pulled out while the getting was good. One thing is for sure: appreciation is topping out. Rising home prices and a tight supply of homes for sale are keeping buyers at bay. A monthly index measuring signed contracts to buy existing homes, so-called pending home sales, fell 1.4 percent in August compared to July, according to the National Association of Realtors (NAR). Expectations had been for a slight increase. While sales are still 6.1 percent higher than one year ago, the annual gains are shrinking. Home prices in July were 5.3 percent higher than July of 2014 and are now just 5.5 percent below their peak from June of 2006, according to a new report from Black Knight Financial Services. After rising through most of the spring, mortgage rates came down slightly in August, but not enough to entice more buyers into the competitive market. The potential for higher rates is just one of several concerns Realtors now cite. I agree that the FED is inflating the old bubble however this is really semantics. They are just using a different mechanism to path it. You call it based on stable factors. How much “illusionary” value has been lost in the market in the last few days? Was that stable? Mirages always look fine at a distance. Sorry I dont believe in the mirage. You may be right. If we see a major decline in a real estate market dominated by fixed-rate mortgages, I would be forced to rethink all my ideas on how real estate markets work. Typically, a decline needs a flood of must-sell inventory, generally from the collapse of unstable financing. However, it could come from other sources (like Chinese sellers). In order for Chinese sellers to crash the market they would need to sell in sufficient numbers to dramatically outpace demand. The more prices fall, the more demand rises. So any crash is self-limiting. Based on the fact that prices rose quickly from 20% below current levels, there is a lot of demand at those prices. And once the must-sell inventory is absorbed, it’s back to the same status quo. There is also the possibility that instability in China will accelerate real estate purchases here in the short-term. Repatriation is difficult, if not impossible, since the Chinese are masters at keeping money off the books. Money? What money? All cash, no records. Transferred between family members six ways to Sunday. Good luck. If the Chinese repatriate during a period of low rates when prices are affordable, the market will absorb it, but if prices are not financeable because rates are too high, any forced sales due to repatriation would be devastating to the market. It would be like stock short sellers forcing inflated prices quickly down to the stable equilibrium. Once again, how the equities or housing market moves on a daily basis, or even yearly basis, matters little to people investing for the long term, and buying a house for the long term (when they’re financially prepared). Forget price movements. What matters is the value you can get for your money. A lousy investment is still a lousy investment even if you are financially prepared or hold it for the long term. My house is a consumable with a forced-savings feature, not an investment. I agree that it is a consumable, but disagree about the forced savings feature. That presumes prices are declining at a slower rate than you are paying down principal. I would never refer to the principal payments that I’ve made on my 2006 condo purchase as forced savings. Likewise, the decline in Irvine prices would need to be slower than the rate of amortization on your mortgage for any savings to take place. What’s the probability, over a period of many years, that the decline in principal is less than the decline in price? What’s the probability that the difference is dramatic? Over a seven year period, the value of our house would need to drop a total of 12%+, to have consumed every dollar of principal reduction. Since our net housing costs are slightly lower than rental parity, we’d still be in a net positive position. However declining values may outpace forced-savings amounts. If every potential home-buyer really understood this quote, we never, ever would of had the real estate bubble to begin with. But there is something circulating in our culture that makes the financial-crack-cocaine world of real estate irresistible. Instant gratification, instant prestige and power, and endless riches to eternity. All that sounds so *much* better than replacing the roof, property taxes, liability insurance, and painting the kitchen. In other words, don’t bother me with reality. That is the truth. Everyone thought real estate was a can’t-miss investment during the bubble, so when prices crashed, they lost their entire investment, plus they were underwater and trapped in a house that cost much, much more than a comparable rental. If they had paid attention to rental parity, they would have avoided the whole mess. Houses are an investment. You can never forget that. We are just entering step 2 (wage recovery) of the housing rebound: 1)job recovery; 2)wage recovery; 3) housing sales recovery; and 4) housing price recovery. The combination of inventory and rate manipulation pulled step 4 ahead of step 1, so I expect housing price increases to moderate and sales volumes to rise for the next few years. If there were a step 5, it would be rate recovery. Rates can only recover as the underlying economy recovers. Rates rise in a free market as a response to rising expansionary demand for borrowed money. As individuals and businesses increase their purchases of durable goods more jobs are required to meet the demand. Wages rise as the labor market tightens. As production nears capacity, businesses expand to meet demand and capital is reinvested in purchasing new equipment. Rates can rise in this environment without causing prices to fall. This is the normal business cycle. When the business cycle gets out of control, the Fed steps in to moderate inflation by raising rates above their natural level. In effect, the Fed causes goods and services to be less affordable to blunt demand. With rates so low, a small nominal increase in rates will have an outsized impact on borrowing. A quarter-point increase has a much larger impact when rates are at 4% than when they are at 8%. The Fed should consider smaller than normal increases instead of longer periods between increases. This way the economy can absorb the increase without recessing. The financial sector is impatient for rates to rise. I won’t say they don’t care if the patient recovers, but their primary concern is that they start to receive their normal supply of O-negative. Sure, the patient is still slightly anemic, but he’s recovering. And vampires gotta live too… So the Fed is being pressured to start the blood bank up again. The financial sector won’t lose sleep over the patient spending more time in the ICU, if it means that their own health is restored. This is how I see it as well. If we enter into recession, we may see some selling pressure, but even if that happens, the federal reserve will lower rates to zero again to prop up housing and the banks. The banks may want higher rates, but if higher rates negatively impacts the collateral value on their real estate loans, they will want to see rates move down again. This is a very important consideration that most people fail to understand. I’m starting to hear pundits on CNBC/Bloomberg supporting an eighth move higher, rather than a targeted quarter move higher. You gotta love the pundits who scream, “Just get it over with a raise a quarter. It’s not a big deal at all and hardly matters.” Yet, they’re so vocal in demanding this raise, that you have to wonder – If it doesn’t matter at all, why are you so adamant that it be done this very moment? Some people can’t handle uncertainty. Plus they’re idiots. I think you hit the nail on the head with that one. I think part of the bizarre talk coming out of the pundits is and angst of uncertainty. Beware mistaking the illusion of recovery for actual recovery. Michael Hollman says he has a job offer from Amazon.com and just interviewed at Google. But he might ditch them both for Lincoln, Nebraska. Hudl, a startup that provides video tools for coaches and athletes, is offering the University of Nebraska senior a chance to become a hometown hero. It’s raised more than $72 million and boasts a location that’s ridiculously more affordable than the pricey precincts that neighbor Amazon headquarters. There’s as much competitive advantage in not being located in Silicone Valley, as being there. What it comes down to is having the best people produce their best work, at a cost that can turn a profit. Companies have been exporting a lot of tech work to India, why not Indiana? If one particularly metro gets to critical mass of good employees, it could take over and crowd out the other tech hubs. I think high religiosity in most parts of the US are particularly harmful for establishing a tech hub. You have a completely different supply of people there. Try to imagine a tech-start-up entrepreneur that was born and raised in Tennessee. I’m sure you’ll find some, but in much smaller number than in California. The number of these guys in Silicon Valley is amazing though. What does religiosity have to do with tech hubs? I don’t get it. It seems to me the two best predictors of tech hubs flourishing would be a strong university system and a welcoming environment to immigrants (both interstate and international). There might be other predictors I’m not thinking of, but those two stick out for me. Granted, correlation is not causation, so I know the evidence linked is not all that robust. It is just my opinion that religion affects culture in deep and profound ways that are bad for innovation. -Nearly all the states shown as low performing were Confederate states during the civil war that spent many years oppressing blacks. -The highest concentrations of blacks still live in those states. Without controlling for these two facts, the religiosity doesn’t correlate nearly as well with the subpar conditions highlighted in the graphs. For instance, Utah has probably the highest religiosity of any state, yet it does well in most of the measures and Ogden is a burgeoning tech hub (to refute your earlier point). Try looking at all the charts in reverse to see who the highest performers are and generally the Midwestern states are equal to or better than the NorthEast and West Coast across most of the measures, even though the level of religiosity is higher. So you have a high degree of positive correlation in the South and moderate degree of negative correlation in the Midwest based on the level of religiosity. Yet the blog’s author only chose to highlight the South’s lack under performance in the data and not to highlight the MidWest’s out performance. I wonder why that is? Well, the answer is the author is highly biased against religion, so of course he is going to fit the data to align with his preconceived conclusions about religion. It’s the ‘scientific’ thing to do I guess. I guess that’s the difference between me and you. You see an innovation “dead zone” and I see an untapped market. Think of all the prayer apps, Nascar games, and other stereotypically southern pastimes that aren’t being met. Who better to write the code than people who live there? It’s entirely one thing to write an app than to start a tech-hub. You need much more than cheap real-estate to start a tech-hub. That being said, you do make a valid point in that areas outside Silicon Valley are under-served “tech”-wise, and it is an untapped market. Realistically I could see computer science based workplaces popping up in more and more areas across the US. However semiconductors, bio-tech, high-tech R&D, etc. would have a much much harder time taking hold in these areas as they are much more specialized. I stopped reading Charles due to apocalyptic undertones. He has some goods points, but I’m a little more positive about our collective ability to hold things together. It’s mainly because I believe that the sheeple will continue to go where the sheep herder leads. It’s gotten them this far, right? Anyway, I’m with you. The next indicator will be decreasing rents. If they don’t go down, then housing remains a pretty good substitution at these prices and interest rates. The only moves I see otherwise are tied to rate changes, and the FED appears to be trapped in zero interest rates for the foreseeable future. Charles Hugh Smith is an excellent writer, but sometimes I think he gets so enamored with his style that he loses the substance. He could provide content to ZeroHedge. I definitely agree that the federal reserve is trapped with low rates for the foreseeable future. The increased cost of borrowing will have such a negative impact on housing that they will be forced to keep rates low even if inflation starts to become a problem, which is still a long ways off. Bernanke was quoted as saying that rates will not normalize in his lifetime. I’m assuming he thinks he’ll be alive for a many years. ZeroHedge.. Hah…any economic blog that has an audience where advertisements for mail order brides work…. Should be avoided. If the ads are proffering gold or bitcoin, they should also be avoided. * The GSE profit sweep should end. Treasury should put profits into a Capitalization Reserve Account, to both provide a short-term loss reserve and a long-term capital source to ensure the GSEs’ continued critical role as a reliable cash window for smaller lenders. * Congress should direct the FHFA to develop a plan to show how the GSEs could be recapitalized, and whether it recommends doing so. * The GSEs should control “up-front” risk-sharing pilots, with protections against market concentration, including bans on volume discounts and bans on securities firms doing risk-sharing MBS from dealing preferentially with bank affiliates. * FHFA should complete work on a common securitization platform and single security – but should not turn over the CSP (developed at taxpayer expense) to Too-Big-To-Fail bank/securities firms. * The Federal Home Loan Banks should not use an explicit or implied taxpayer guarantee for MBS unless all mortgage lenders, including nonbanks, can participate on a non-discriminatory basis. Despite being a whining industry shill, David Stevens complaints about the CFPB and his suggestions for reform are reasonable. Since the inception of the CFPB complaint database you may have read, in multiple news publications, my serious concerns about the entire idea of an online review site that permits unverified complaint narratives without allowing the accused the ability to respond. I firmly believe this database continues to fail the transparency test, and without real reforms its so-called growing pains will ultimately be its undoing. The basic premise of this database is noble. Consumers can voice their complaints about their experience with a lender and take comfort in the knowledge that their concerns are being heard. But the CFPB has failed to install a mechanism to substantiate or verify any of these complaints. In fact, the Bureau does not allow financial institutions to adequately respond to the claims. Equally concerning, the database could be putting the consumer’s privacy in jeopardy. Misinformation can, and has, infected the entire system and CFPB has yet to take real steps to correct it. Just this past week, the CFPB released the monthly results of consumer complaints. Included in this snapshot are notations of the lenders with the most complaints. The biggest lenders dominate the list. Is this surprising? The companies that issue the most loans have the most complaints? That’s like saying California has the most delinquent loans. Of course it does. California may have more loans past due than any other state, but its delinquency rate is much lower than that of other states, due to its relative size. So what should be done about the CFPB database? * First, the CFPB must verify all of these complaints before being published. This includes validating the authenticity of not only the complaint, but also the person making the complaint. It also means talking to the financial institutions and seeing what is being done to correct any problems. * Second, the CFPB has to stop releasing these monthly results until they can scale these complaints to the size of the loan provider. It’s quite possible that the lenders mentioned in these monthly snapshots have a low complaint rate compared to the total number of loans they issue. However, without normalizing the data, the reader is left to draw incorrect conclusions about the financial institution. There is a lot of good being done by the CFPB. But this database continues to provide a disservice to lenders and consumers alike. It is of the upmost importance that they fix the glitches in their system as quickly as possible. I don’t see the problem. When the West was first settled, natural selection quickly weeded out those foolish enough to build in the trees. It took time and a lot of effort to build shelter back then. Even if you survived the fire, you wouldn’t have any trees left to build with, and you would freeze during winter. Society’s job is now to protect people from their own stupidity. If you build your home inside a fireplace, you are assuming the risk that it will catch fire. If the insurance company is willing to insure the home against fire, then they should also front the money to defend their asset against the probable outcome. The problem is that none of the people who benefit from this kind of development end up paying the charges. The cost of fire supression in these areas costs all of us a great deal of money, but it only benefits the few who live there. If those few didn’t live there, we could let these fires burn like they used to. If these homeowners were made to pay the true cost of living in these areas, the cost would be so high, they would let the house burn down in the next fire and move on. I think we are making the same point: Why don’t we just let the fires burn like they used to? If people choose to build houses in VHRFA’s then they can’t complain when nature predictably turns it to ashes. By keeping trees and brush several hundred feet away from houses, and using resistant materials and building techniques houses can be built safely in those areas. This is just another example of the nanny-state mentality, where no bad decisions have any impact. Society can’t afford to waste resources fighting unwinnable battles. Fires are part of the natural ecosystem, anyway. It’s natures way of removing the old dead trees and providing open areas for new saplings to grow. Why don’t we just let the fires burn like they used to? If people choose to build houses in VHRFA’s then they can’t complain when nature predictably turns it to ashes. Unfortunately, they do complain — loudly — and politicians pander to them. That’s the root of the problem. According to the chart, real incomes are at 20-year lows. That is a bubble nobody wants to talk about. Capital gains (profits) have been rising and wages have been falling. More income than ever goes to the asset holders (capital gains) than the workers (wages). This has resulted in greater than ever income inequality. Today, the share of GDP going to workers (wages) is the smallest it’s ever been. Unfortunately, this trend is still getting worse. A fight for better income equality is a fight for a higher median income. BTW. Trickle down economics doesn’t trickle down. Let’s not presume asset holders and workers are mutually exclusive groups. Employees in tech-related industries receive equity as part of their compensation packages. If you’re lucky, you’re receiving annually, stock options, grants, and participating in an ESPP plan, all while the stock is growing decently. This can become a huge amount relative to your salary every year. You can be both an Evil Capitalist and an Evil Higher Earner! Exactly this is why I don’t fully believe the income stats and think they do not tell the entire story for premium job locations. If you take the time to understand the issue, you would realize that income inequality hasn’t been growing as much as you claim. This article appeared in the National Review (Online) on May 14, 2014. From President Obama to Paul Krugman, Thomas Piketty to Elizabeth Warren, the Left has adopted “inequality” as the cause of the day. They paint a picture of a new Gilded Age in which a hereditary American gentry becomes ever richer, while the vast majority of Americans toil away in near-Dickensian poverty. It’s a compelling political narrative, one that can be used to advance any number of policy proposals, from higher taxes to increases in the minimum wage. Conservative news my friend. I didn’t see much relevant data in the article regarding income. I noticed that too. As soon as I saw it was published in the National Review and written by the Cato Institute, I knew the conclusions would be heavily slanted toward the rich. Where else are you going to hear the conservative viewpoint if not from conservatives? Don’t be a denier. Just because you disagree with the conclusions doesn’t make the analysis invalid. The basic issue revolves around how to measure inequality: by household income or by disposable income. Liberals point to the growing disparity between household incomes. Conservatives point to the static disparity between disposable incomes. Sure, the top quintile has higher household incomes than the bottom quintile, but they also work twice as many hours. They also provide substantial support to the bottom quintile in the form of transfer payments, which decreases the top quintile’s disposable income but isn’t counted as household income to the bottom quintile. If quality of life is important, then disposable income is a better indicator of the success of the War on Poverty. Growing disparity between high and low wage earners is necessary to fund the growing transfer payments, anyway. If liberals were successful in their war on inequality, they would lose the war on poverty. Actually, I don’t disagree with the conclusions, but I am very suspect when I read papers from sources I know are prone to interpret data in a way the confirms their preexisting biases. I also read Paul Krugman with the same grain of salt. That we can agree on. It’s always a good idea to read defensively. What I find suspicious about the income-inequality caucus is the lack of specificity in framing their arguments, and the lack of response to those who try to dig into the details of what they are claiming. Typically, there is a chart showing that income inequality has increased over the last 3 decades, without any discussion of why. If you don’t understand the why, chances are you don’t understand the what, either. Maybe their are sound reasons that incomes have increased at the top relative to the bottom (like changes in the tax code has caused more income to be declared and taxed, for instance). The whole point of “income inequality” is to provide upward mobility of its champions to move those individuals from the bottom tier to the top tier. Nothing else. Raising minimum wages will only hasten job destruction via automation, thus making household incomes more unequal than before. The vagueness of these “studies” is probably intentional. They are generally used to promote some socialist / redistributionist idea that generally doesn’t make much sense. The only crazy idea I liked is to increase the inheritance tax threshold, and raise the tax on estates over the threshold to 90%. If people know they will end up giving it to the government anyway, you wouldn’t see such insane risk taking. As it stands, people believe they can leave behind multi-generational wealth, so it prompts them to do whatever it takes to make a fortune. The saying is that the rich get richer, but in the real world, large fortunes generally dissipate within two or three generations because they get divided up, and some of the heirs are spendthrifts. I do believe wealth disparity is a problem. But I haven’t seen a proposal to correct the problem that doesn’t create its own bevy of problems. As long as the wealthy aren’t stealing from me, let them eat cake. Does this go in the pro or con pile? Provided the “whatever” is legal, then leaving behind multigenerational wealth is a strong incentive. In order to reach their full potential, individuals need to know that their efforts won’t be limited by government edict. If two workers produce 10 widgets of similar quality, they should both be paid the same. But if one produces 20, then shouldn’t he be paid more? Increasing this to 20 thousand widgets doesn’t change anything. Redistributing half the wealth of the more productive worker takes incentive away from the more productive worker, but it also takes it away from the less productive one. It isn’t right to let the less productive worker starve, but a reasonable balance should be struck. 90% inheritance tax is not reasonable. Besides, much of this inherited wealth goes to charitable foundations, and medical research. This money is more efficiently spent than giving it to the government, and it reflects the wishes of those who earned the money. Many choose to limit the inheritance, and put the rest into foundations anyway. The net effect of raising inheritance taxes would be to decrease charitable giving and endowments since the 10% that’s left would go to the kids. The distribution of income is less important than the standard of living across the spectrum. You could have massive inequality but if the lowest rung was living in 4 bedroom houses, owned multiple cars, took vacations, and had enough disposal income for other luxuries who cares if the highest is living on vast estates with even more junk. This has always been the attitude of the very wealthy, and they are probably right. Real estate is local. Looking at real income in the US over the last 20 years tells you nothing about people’s ability to own, anywhere in the US. Take the 2013 Current Population Survey, for example. The YOY change in income (adjusted to 2013 dollars) was +.35% for the US as a whole. It was +11.31% in New York, -10.86% in Oklahoma, and -.55% in California. Over ten years: -5.33% US, -.65% NY, -3.73% OK, and -7.87% CA. But, +8.78% South Dakota, and -20.72% Nevada. Over 20 years: +4.73% US, -20.20% NV, +39.98% District of Columbia, +6.36% CA. Is there a bubble in real income in DC over the last 20 years, or a potential bubble in NV over the next? That really depends on why the real income rose in one, why it fell in the other, and whether those conditions will continue, or reverse. 1. Rates are likely to stay low for longer: In keeping with PIMCO’s New Neutral thesis, the Federal Reserve has demonstrated that it is likely to take a very gradual and cautious approach to its normalization of interest rates. Policy rates, globally, are likely to stay low through the rest of the decade, supporting equity and credit markets, as well as real assets. 2. Volatility will result from the unwinding of crisis-era policies: Markets have become accustomed to, and somewhat dependent on, central bank support, particularly in the absence by national governments in efforts to bolster economies. Even the threat of removal can cause upheaval in markets. 3. Economic growth, rather than liquidity, is needed more than ever to bolster asset prices With the Fed no longer adding financial liquidity into the U.S. financial system, and the Fed’s balance sheet shrinking as a percentage of the U.S. gross domestic product, investors are likely to focus more than ever on economic growth and company cash flows when making investment decisions. 4. The interconnectivity of global markets is greater than widely understood: When constructing an investment portfolio, we believe it is important to focus on risk factors (equity, interest rate and currency, for example), and to understand how financial instruments might correlate to each other under various scenarios (including stress scenarios) in order to optimize return prospects. 5. Divergent central bank policies reflect the multi-speed global economy: In the current global economic recovery, many nations are on different paths or moving at different speeds along the same path. As demonstrated in 2015, this presents investors with a broad array of both risks and opportunities requiring active management of portfolios in order to optimize portfolio returns in a low-returning investment world. This is part of a much longer piece. I found the description below particularly apt. A skeptic is one who prefers beliefs and conclusions that are reliable and valid to ones that are comforting or convenient, and therefore rigorously and openly applies the methods of science and reason to all empirical claims, especially their own. A skeptic provisionally proportions acceptance of any claim to valid logic and a fair and thorough assessment of available evidence, and studies the pitfalls of human reason and the mechanisms of deception so as to avoid being deceived by others or themselves. Skepticism values method over any particular conclusion and takes a position of humility toward complex areas of knowledge requiring extensive expertise. In order, in my opinion, to qualify as a skeptic one has to rigorously following a method of inquiry that approaches what I just described. This means carefully examining your own ideology and biases, and fully accounting for the consensus of scientific opinion, without overstepping your own expertise in the relevant area. True deniers follow a different approach, whether they explicitly know it or not. Denialism is a form of pseudoscience. Deniers tend to start with their conclusion, because they are ideologically opposed to the current consensus of scientific opinion, whether it be on climate change, evolution, the safety of vaccines, the legitimacy of mental illness, or the historical accuracy of the holocaust. They then follow a process which is fundamentally different from scientific skepticism, even though they try to portray it as skepticism. – Deniers do not fairly assess the scientific evidence, but will cherry pick the evidence that seems to support their position. – They will make unreasonable or impossible demands for evidence, move the goalpost when evidence is presented, and refuse entire categories of legitimate scientific evidence. – They primarily focus on sowing doubt and confusion over the science they deny, rather than offering a coherent alternate theory or explanation. – They will exploit ambiguity (and even create ambiguity) in terminology or employ shifting definitions in order to create confusion or apparent contradiction. – They will attack scientists personally, and engage in a witch hunt in order to impugn their reputations and apparent motives. – They will cast doubt on whether or not a scientific consensus exists, attempt to claim that the tide is turning in their favor, or claim that a secret consensus of denial exists but is suppressed. They may also cite outlier opinions as if they were mainstream. – When all else fails they will invoke a conspiracy theory to explain why mainstream views differ from their own. Blind faith is just as bad as willful denial. They claim consensus when there isn’t one. They claim theory is fact and refuse to discuss alternate theories or explanations. They cite evidence supporting their position without providing access to the underlying data. Once the underlying data is finally produced, they refuse to discuss the obvious holes in the data, and the implications to their analysis. They claim models prove their theories without discussing methodology or the underlying assumptions supporting their models. They refuse to discuss lower-level details, the existence of which calls into question their theory, analysis, and conclusions. They cut off debate when their theories are challenged. Part of being a skeptic is requiring proof. The burden of proof is on those making the claim, not on those denying it. The less obvious the claim, the greater the standard of proof ought to be. The more contrary to mainstream scientific conclusions, the more definitive the evidence has to be. A consensus is, by definition, a general agreement amongst those in a group. When skeptics are called deniers, and their dissent is excluded from consideration by those in the “consensus” [the only requirement to be in the consensus is similarity of belief], then science loses, and we are all become more ignorant than we started out. The word denier might as well be atheist. Unbelievers need not apply. The path to Truth has a ditch on both sides. Blind faith in beliefs can direct anyone into the ditch on one side or the other. As I read this description, I was struck by how much it described the behavior of climate change deniers and evolution deniers. I probably also accurately depicts most of the nonsense spouted by the current crop of Republican Party candidates. Looking through the tax data for Irvine today, I noticed that while 3100 new returns were filed in 2014 over 2013, total tax liability fell by $5M. Total AGI also rose by $390M. It seems that the tax liability may be falling as renters return to ownership to take advantage of the MID and low rates. It wasn’t uniform across all zip codes. 92618 and 92620 both increased by 1583 and 1391 tax returns filed, respectively, with total AGI rising by ~$200M each. 92602 thru 92604 AGI fell by a combined $116M. It could be that high income renters are moving from 92602-4 into 92618,620 and buying. These renters are then replaced by lower-income renters in 92602. Not sure what to make of it, but interesting. The Irvine Company built a great many apartment units over the last several years. Those renters will add to the total number of households and distort the data wherever they are concentrated.